We have three different Dantians丹田. 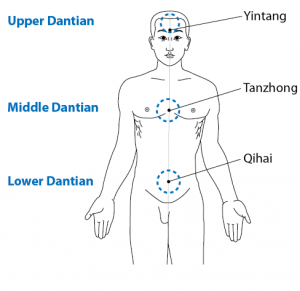 The Lower Dantian, which is at the Qihai point氣海, the Middle Dantian, which is at the Tanzhong point 膻中and the Upper Dantian, which is at the Yintang point印堂. 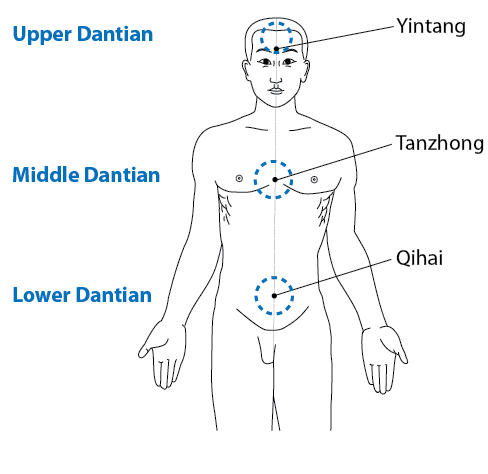 In Qigong training, we call the Upper Dantian the Sky Eye (Tian Mu). Some other skills sometimes refer to it as the Third Eye. Do we really have a third eye? Yes we do! But it is not like our normal eyes as we only see with these. With this eye we see with our mind. The picture we see are not as clear as those we see with our normal eyes, but when the Skyeye has opened and is developed we start to pick up messages and signals. We start to know things, for example you might think of a friend and suddenly that person sends you a text. Also it is like when a mother knows something is happening to her children, or a couple who know each other is thinking before they say or do anything. These things are all possible because our minds can receive other peoples’ energy and thinking. We can read the energy of those people who are close to us as we know them better. Many people have this ability, particularly ladies and young children as they are more sensitive.